Cacao rituals seem to be the taste of the hour. I heard of it for the first time a couple of months ago from a friend who enthusiastically shared his experience of a 3-hour-long cacao ceremony at Osho Mauz. I haven’t been there yet, but I experienced a cacao ritual warm-up at the last ecstatic dance at Haus der Lebenskunst, with cacao facilitator Melouka Knorr. 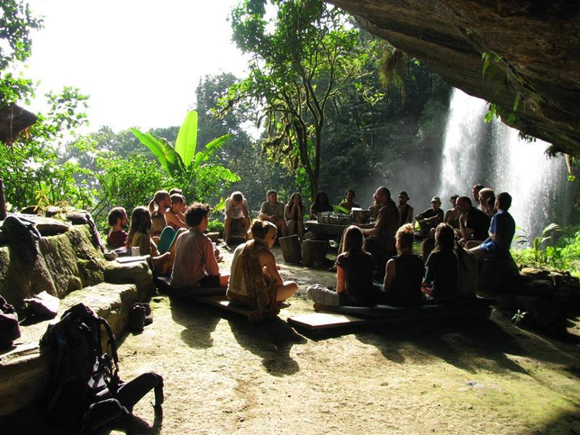 Now, the Berlin-based cacao healer and visionary Kat Tiger is joining forces with Melouka and a group of other mostly Berlin-based cacao healers to facilitate a whole 1-day-festival focussing on the sacred bean of the incas and mayas. 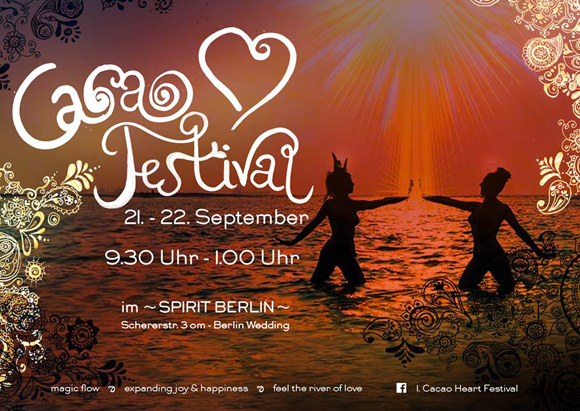 This saturday, september 21st, the date of the traditional German “Erntedankfest” (the German thanksgiving), the 1st Cacao Heart Festival will take place at Berlin’s new spiritual center “Spirit” in Wedding. On a total space of 300m2 with two big and two smaller workshop spaces, a rooftop garden, a spacious food lounge with a vegetarian buffet, the event will feature 19 different cacao rituals and related healing sessions involving dance, touch, bodywork and sharing. During the whole event, there will be dancing and music by DJ Steve Korch at the outdoor terrace. After the last ritual the main workshop space turns into a dancefloor as well, with DJ Rico Loop at the turntables. The ceremonial drink offered at the festival is raw, vegan and bitter cacao from Guatemala. It can be sweetened with honey or sugar or spiced with chili according to taste. Cacao is not the same as the regular cocoa from the supermarket. Cocoa powder is raw cacao that has been roasted at high temperatures which change the molecular structure and reduce the enzymes, thus lowering the nutritional value. Raw cacao is made from cold-pressed, unroasted cocoa beans. The fat (cocoa butter) is removed and the living enzymes are kept. According to the schamans of the rainforest, cacao opens the heart and reconnects us to our emotions. In South-America cocoa is called the “food of the gods“. According to the legend, whenever humanity is out of balance, the sacred goddess cacao will come to save the people and bring them back to themselves and their true nature to live in peace and harmony with each other again. Besides its role in spiritual ceremonies, raw cacao has many health benefits: It is rich in minerals (magnesium, potassium, calcium, zinc, copper and manganese), anti-oxidants, and lowers the insuline resistance. Cacao protects the nervous system, reduces the blood pressure, the risk of cardiovascular disease and the risk of stroke. As a potent anti-oxidant, it counters the damages by free radicals, can prevent cancer and slow down the ageing process. 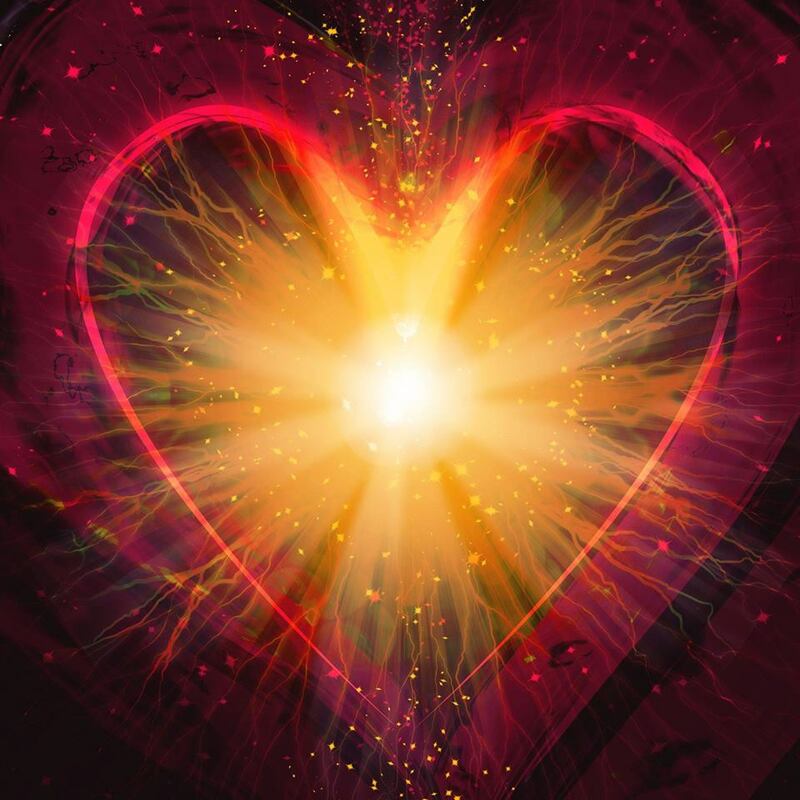 Containing phenylethylamine, a brain chemical that is also released when we experience deep states of love, cacao also makes you feel damn good. More information on the facebook event page: https://www.facebook.com/events/1455804354703016/?fref=ts. You can book the event here: https://shop.ticketscript.com/channel/web2/start-order/rid/MGRR52YG/language/de. Or write an email to Kat@tigermove.com. The day ticket costs €40, the evening (from 7 pm) €20, if you book in advance. Tickets at the entry are €45 and €25. A Facebook group named “Cacao Love Tribe” informing about upcoming events is already planned. You also find information about new cacao events by Kat Tiger on her website Tigermove.